ECHINODERMATA : SPATANGOIDA : Spatangidae STARFISH, SEA URCHINS, ETC. 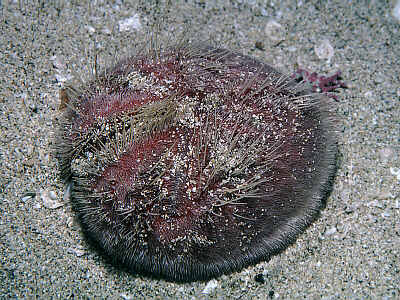 Description: This is a large, somewhat flattened heart urchin, purple in colour. There is a deep notch in the front of the test, corresponding with the frontal ambulacrum, but the petals of the dorsal surface are not indented. There is only a subanal fasciole, no fasciole on the upper surface of the body. Up to 12cm in length. Habitat: Lives in coarse sand or gravel, usually completely buried but sometimes with the dorsal spines just breaking the surface. Specimens can often be located by looking for furrows in the gravel where the animal has moved along beneath the surface. Distribution: Found all round the coasts of the British Isles. Similar Species: Spatangus raschi is similar but has not been found much shallower than 150 metres. It is dome-shaped and only incompletely buries itself. No fasciole on the upper side of the test. Picton, B.E. & Morrow, C.C. (2016). Spatangus purpureus O F Müller, 1776. [In] Encyclopedia of Marine Life of Britain and Ireland.